The diversity of Faribault as photographed at a downtown car show several years ago. Minnesota Prairie Roots file photo. DIVERSE. 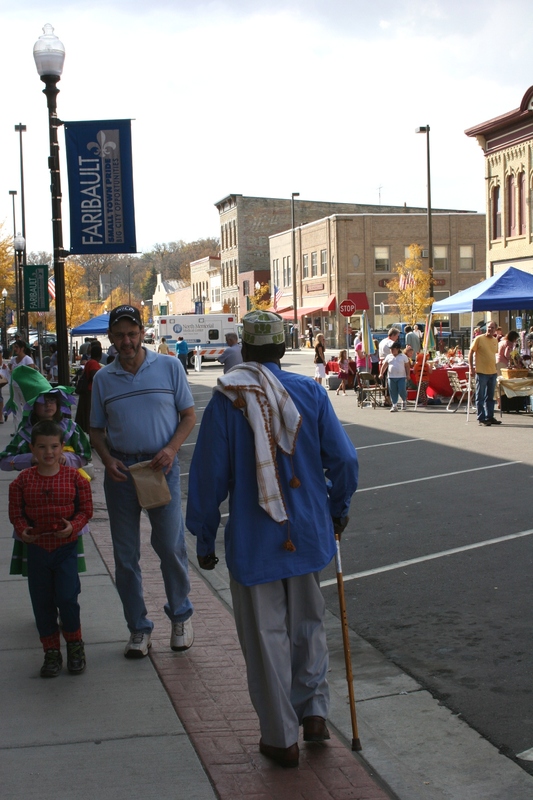 MY COMMUNITY OF FARIBAULT fits that label with a multi-cultural population. We are a place of European descendants, of Hispanics, of Somalis, of African Americans, of Asians and more. A place of peoples descended from immigrants and a place of peoples who are new immigrants. 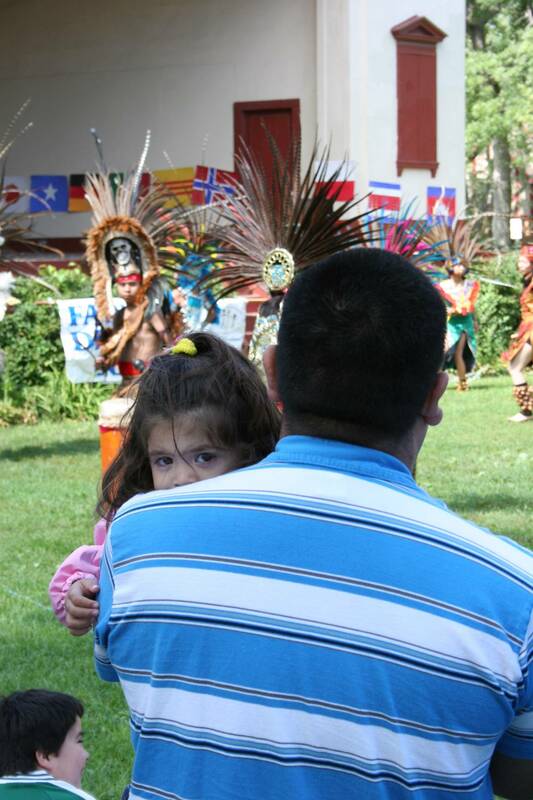 The Faribault Diversity Coalition celebrates the cultures of our southeastern Minnesota city at the free 2018 International Festival from 10 a.m. – 3 p.m. this Saturday at the Washington Recreation Center, 117 Shumway Avenue. Attendees mark a world map with their countries of origin at a past International Festival. Through food, dance, music, art, games and more, our cultural differences will be highlighted, celebrated, embraced. At a past International Festival, I sampled this spicy Somali food and loved it. Minnesota Prairie Roots file photo. While I can’t attend this year’s fest, I have in the past. It’s a great opportunity to meet others, to engage in conversation, to learn about other cultures. And to sample food. Vendors will serve ethnic foods like Somali sambusas, Cambodian egg rolls and culturally-themed cupcakes. Food lends itself to kickstarting conversations and connecting cultures. A flag ceremony featured national anthems and information about the countries from which Faribault residents have originated at a previous fest. Minnesota Prairie Roots file photo. The Diversity Coalition’s Passport Project, funded with an Artists on Main Street grant, debuts at the fest. FDC Director Gordon Liu terms it a mini cultural museum—with quick facts, basic phrases and a brief history of selected countries—to be displayed in the FDC storefront window. Photo courtesy of Samuel Temple. High School students Samuel Temple and Logan Ledman, who produce the 1855 history series for local public cable TV, will show their documentary “Peoples of Faribault” and then stick around for a Q & A. I’ve watched that show and recommend it to anyone who truly cares about understanding the cultures of my community. There’s much to be gained from attending an event like the International Festival. It is an opportunity to learn, to break down walls built over differences in language, dress, culture, faith and more. When those barriers are broken, then we begin to see each other as simply people. People who happen to live in this place we call Faribault. Our home. 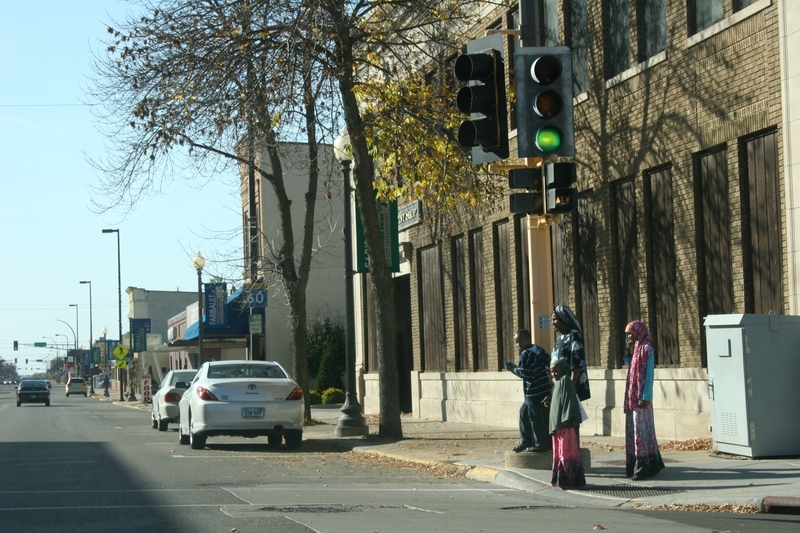 An immigrant family in downtown Faribault. SATURDAY AFTERNOON I shot this image while passing through downtown Faribault. It was a split-second decision to lift the camera from my lap and aim through the windshield. I had wanted for some time to photograph the newest residents of my town of 22,000. Technically, this photo is lacking. But from the standpoint of depicting the changing face of my mid-sized Minnesota community, it’s perfect. We are no longer just a city of German, Irish, Scandinavian, Polish, or, in Faribault’s case, strong French descent. We have become a community of color and of varying cultures. Hispanic. Somali. Sudanese. Asian. 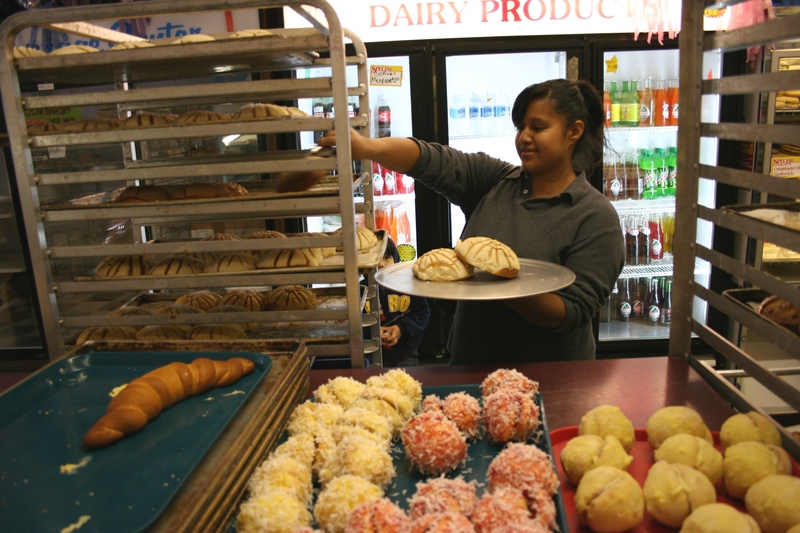 Choosing pastries in a downtown Faribault Mexican bakery. 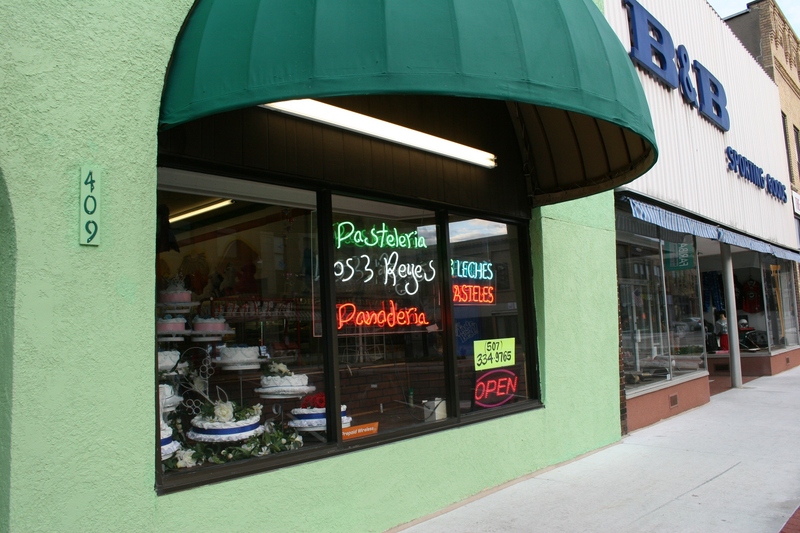 Los 3 Bakery in Faribault was painted in this shade of green until about a year ago when some local business owners objected to the bright color. They donated money to repaint the building a subtler green. Different cultures, all the faces of today's Faribault, mingled during the recent Fall Festival along downtown's Central Avenue. As much as I would like to say that we all embrace, accept and respect each other, I would be lying. I’ve heard the derogatory remarks, the ignorant comments, even among friends and acquaintances. Crime connected to “Mexicans.” Groups of Somali men hanging out downtown. Too many people living in one house. Such unfair general categorizations and culturally uninformed biases raise my ire. Who are we to make sweeping judgments about an entire ethnic group? After all, I typically pronounce, didn’t our grandparents or great grandparents arrive here, in the land of opportunity, from many different countries? Fortunately, many Faribault residents realize that and understand that we need to welcome our newest residents. We have, for the past 15 years, had the Faribault Diversity Coalition to lead the way in helping our immigrants. The Welcome Center opened its doors as a vehicle to facilitate the process. Two weeks ago, though, the FDC and The Welcome Center announced that they would disband in December due to a lack of funding. That disheartened me, although I understood and knew how hard the two groups had struggled to continue. Then last night, to my absolute surprise, I received a mass e-mail from Milo Larson of the Diversity Coalition announcing that he (and others) had a change of heart. While the Welcome Center will, indeed, close, the FDC will continue. “…There is more need now more then ever to keep our town, state and world a more harmonious and informed place. “As I’ve said so many times the past 10 years we are communicating with real people, with hearts, souls and feelings. Just because some are from different cultures, different color skin, different religions, doesn’t mean they are numbers on a sheet of paper. They’ve all had child hoods, most have had problems with bullies in school, abused by parents, gone hungry, homeless, not wanted in the country they were born in or this country because they are different. I simply have to admire a man with his level of commitment, passion and compassion. Larson is the kind of person you want as a friend or living within your community. He doesn’t care if your skin is black or white or purple or green. NOW, I WANT TO BACKTRACK a minute to the photo at the top of this page, the one of the immigrant family. I am going to admit my ignorance here. I do not know whether the family is from Sudan or Somalia. But I expect that if I asked Larson, he could tell me. There is much we can all learn from each other, for we are all here, on this earth, together. The 2009 International Market Day in Faribault sponsored by the Faribault Diversity Coalition. 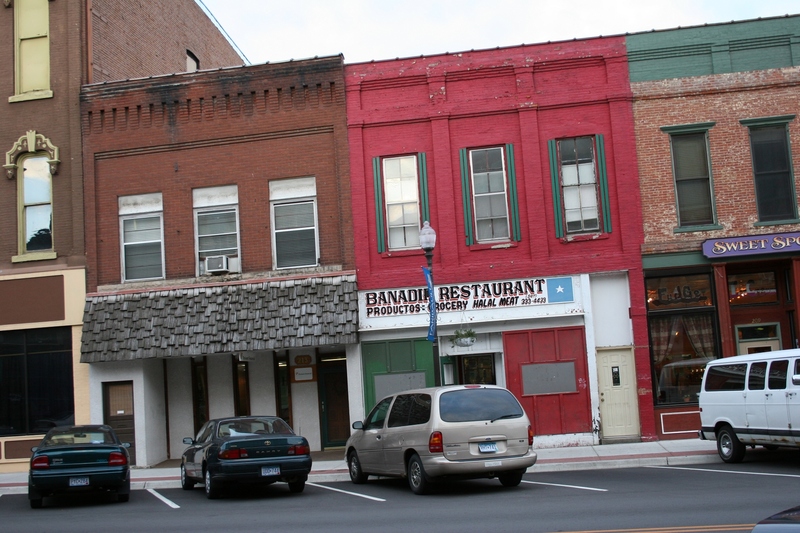 Downtown Faribault businesses include Banadir Restaurant, a Somali restaurant.